Last Thursday 16 teachers from special schools in Sheffield, Derbyshire and Doncaster descended upon the CLC to look at the new Computing Curriculum and how the computer science elements can be taught to students with special needs, particularly those working at upper P levels, KS1 and 2 levels. The day was split into four sections: an introduction by myself, plus a presentation from James Winchester who works in a generic special school in West Sussex; a session on the KS1 programme of study in conjunction with Fraser Speechley, IT lead at Talbot Specialist School; a session on the KS2 programme of study; and finally a choice of workshops (Scratch introduction, iPads or assessment). Many teachers are concerned about the content of the new curriculum, and the aim of the day was to help attendees feel more confident in delivering the newer areas, and provide them with concrete ideas for teaching it. Many SEN students won’t be able to program a computer, but this doesn’t mean they can’t learn some of the concepts and skills leading up to having it. In the new Programmes of Study for Computing it states: “A high-quality computing education equips pupils to use computational thinking and creativity to understand and change the world.” For the students taught in special schools, being able to understand and have some control over the world around them is hugely important. Technology provides greater opportunities for these young people to access the same things as their peers, and ideally they can begin to have some influence on their experience in school and at home through a better understanding, and ultimately manipulation, of a range of technologies. James Winchester talked about how they have started to integrate parts of the new progammes of study into their curriculum this year, moving students from being consumers to creators of information, and the barriers faced by their students in terms of difficulties with processing information, short-term memory, numeracy and literacy and access. He mentioned resources such as the CEOP website for teaching about eSafety – thinkuknow.co.uk, and Hackasaurus (which I think is now called X Ray Goggles from Mozilla) to remix web pages. It was great to have James travel all that way to share what he has been doing, and he can be found on twitter here. – We looked at introducing algorithms in terms of sequencing instructions and parts of stories. Using a variety of talking postcards, boxes and buttons from TTS, attendees put parts of the Gruffalo story in order. There was also an activity creating a sentence from the parts “the mermaid”, “the pirate”, “the shark” and “gives”. The point being that order matters – the outcome is different depending on sequence of words in a sentence, and instructions given to a computer. – There are lots of links with literacy and numeracy in terms of sequencing, and also independent living skills. Students can sequence tasks they do every day, with audio and symbol support, and debug simple algorithms such as getting dressed (putting pants on after trousers isn’t a good idea unless you are superman). – We also made links with science, sorting objects into categories according to criteria. What is the algorithm for sorting animals, or shapes? We used some lovely wooden blocks which are used for threading (see here), with different shapes and colours. The sensory aspect of these adds to the activity, and they would be ideal for visually impaired students. This was then followed by a Bubble Sort – this is a simple algorithm for sorting a set of values in order of magnitude (see another explanation here on the Computational Fairytales blog). The simplest version is with numbers. A computer can only compare two numbers at a time and sort them accordingly – so with the array (list) of numbers [3,5,1,4,2] the computer would compare 3 and 5 and leave them in the existing order. Comparing 5 and 1 it would swap them round etc. This set of comparisons would have to be done a number of times until the number were sorted. We had a look at doing this with sealed envelopes full of nails and a balance scale. The advantage is that pupils can’t immediately see which are heavier and have to replicate the computer by comparing each pair. There are also nice links with science here. Another way of doing it would be with different lengths of string or rolled up paper, or the height of students. – Now followed the jam sandwich making activity. Imagine you have robot which you need to instruct to make a jam sandwich. We wrote down the commands on the whiteboard and my colleague followed them. Literally. This is a lot of fun for a class to do, and really underlines the need for clear and unambiguous instructions. There’s a nice YouTube video here of Philip Bagge doing it with his class. – Music provides a good example of programs and sequences, and we had 4 volunteers up playing the handbells in Wii Music – this follows a pattern of coloured bells on the screen, a bit like the punched cards in the earlierst computers, and the order is very important. The same idea of following instructions can be made with Dance Central on the Kinect, Wii Fit Basic Step Aerobics, or Guitar Hero – great for engaging a wide range of young people. character to do. This is not ideal for older pupils, but it’s fine for the majority. We followed this with the idea of using talking postcards with images on and audio commands to program a class to dance. We use Gangnam Style as our inspiration, but it could be much simpler, e.g. clap your hands, step to the right. Give cards to a number of students at the front of the class, and a volunteer can put them in order to create their own dance program. They play the audio and the rest of the class do the moves to a backing track. – We looked at Beebots, programmable robots from TTS, that follow simple directional commands. The Beebot isn’t ideal for older students, but there is the Constructa-bot, or the Probot car (this has more buttons on so can be confusing). We started looking at the commands, which were laminated and had the Widget symbols on the reverse to help with understanding. I put a coloured sticker in the bottom left-hand corner to help with orientation. These can be used to create programs to move people around a room. It needs to be made clear that turn right means a 90 degree turn to the right here, which isn’t easy for many students. A set of these commands can be found on our resources page. NB you will need Communicate: in Print to open the document. 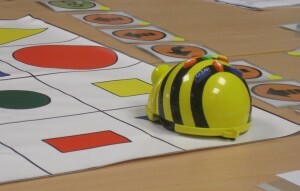 – We then moved onto creating a program to move the Beebots around a grid, using the laminated cards as a guide. The groups chose different ways of laying out the cards to form the program, either left to right, or top to bottom. Thought needs to go into how students are taught to do this. The options range from laying out the cards in the shape of the route; having them in a pile (you can use treasury tags to secure them together, see image right) and turning them over as you execute each command; laying them out left to right, similar to reading; or laying out top to bottom, which most closely resembles the way a computer program will be laid out. We decided there was no right or wrong way of doing this, but perhaps a progression of difficulty. I did create a top to bottom set of slots for the commands using plastic wallets and sellotape. – There are lots of things you can do using the Beebots, for exampe it provides the opportunity to talk about the efficiency of a route, and you can set up sequences of commands with errors in for the students to debug. – There is a free Beebot app for the iPad which is worth using in conjunction with the robots. Many students struggle to enter the whole program, which can consist of a large number of steps, but there is nothing to stop them doing it one command at a time, then building to two or three. They just need to remember to clear the instructions each time. – For older students the A.L.E.X. app may be more appropriate – this is also free and uses forwards, left and right commands to direct a robocop type figure. It also has the advantage of showing the program on the screen. – Finally we talked about a number of other ideas for creating simple programs using physical objects. These included marble runs, brio train tracks, dominoes and water drainage! In part 2 of this blog post I’ll detail the afternoon session based around the KS2 programme of study, and the workshops. If you want more information on how the Sheffield eLearning Team can work to support Computing and the use of IT across the curriculum in Special Schools, please contact Catherine.Elliott@sheffield.gov.uk.